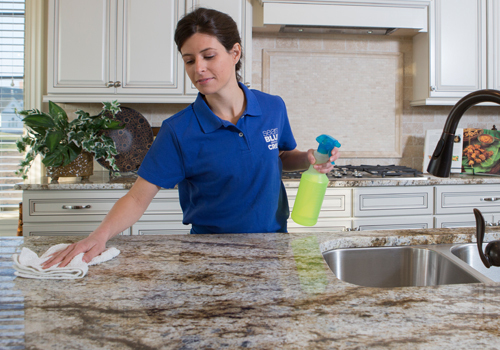 Everyone loves a freshly cleaned home, but not everyone has enough time to get the job done. Cleaning not only takes a lot of time, it requires cleaning supplies, tools, and patience. Sears Maid Services has professionally trained staff members that will clean your house for you. Whether you need a quick clean-up after a party or a deep cleaning before the holidays, Sears Maid Services is available to do it for you. Sears Maid Services staff is trained to handle even the dirtiest of situations. Backed by the Sears Satisfaction Guarantee, you can expect Sears Maid Services to clean your home to your specification. Give us a call at (740) 833-3347. Sears Maid Services offers cleaning on a variety of schedules to suit homeowner convenience. We strive to offer convenient options for today's business families and modern schedules - that's why we offer weekly and monthly cleanings, with other options in between. Whatever option you need, Sears Maid Services will work with you and your schedule. If it's a one-time servicing you need, our employees can perform our signature Deep Cleaning service, which focuses on extra difficult areas to clean as well as our normal cleaning offerings. Office buildings, home offices, and professional spaces need cleaning too. The environment you work in can mirror your business attitude and affect customer perceptions. You want to show your clients and employees that you are organized, tidy, well-kept and on top of the small things. Let Sears Maid Services be the backbone of your professional cleaning needs. The maid staff will clean employee break rooms, bathrooms, and individual cubicles. The maid staff will also organize the lobby, waiting rooms, and vacuum walkways. Keeping the trash cans emptied, the window areas sparkling, and the refuse cleared away will give the appearance of a competent and functioning office space, which every business should possess. A newly constructed home will always need ample cleaning before it can be presented to buyers and appraisers. A fresh scent and impeccable presentation allow potential home buyers to see how a new house can become a home. Sears Maid Services has the know-how and experience in post construction cleaning. The staff's expertise in cleaning construction debris never falters: we incorporate proper safety techniques in the removal of silicon, dust, chips, and nails, into the extensive cleaning required in post construction cleaning. Sears Maid Services will remove unsightly smudges and markings on walls, countertops, bathroom sinks, and floors so you can show the new home in the best light possible. The staff at Sears Maid Services are trained on-the-job and in-house, adhering to all rules of conduct and cleaning regulations. The screening process that is utilized to review future staff at Sears Maid Services is meticulously conducted so that all possible staff members are checked thoroughly. Knowing that you are trusting Sears to deliver staff members who behave with honesty and reliability is important to the Sears name. The Sears Maid Service Satisfaction Guaranteed is a commitment that Sears Maid Services does not take lightly. If there is a cause of concern from any cleaning job, you can rely on Sears to make it right. Whatever the issue, call within 24 hours of the last cleaning job and Sears will send a trained staff member to investigate. Sears stands by the Maid Services Guarantee and if you are an unsatisfied customer. If there's a problem, the staff will make it right without an extra cost to you.